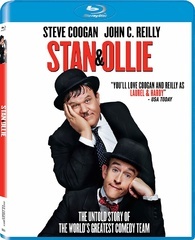 An affectionate and crafty look at the latter years of comedy greats Stan Laurel and Oliver Hardy, Stan & Ollie appeals to fans of the dynamic slapstick duo, but will also fascinate non-fans who may have heard of “the Boys” but may not be familiar with their distinctive brand of screen comedy or their enduring offscreen friendship. Scottish director Jon S. Baird (Filth) and writer Jeff Pope (Philomena) and their production and makeup crews do exceptional work in making the period surroundings and cosmetics alarmingly authentic. 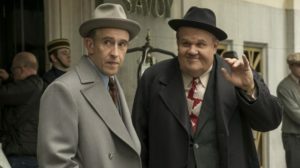 But it would all be for naught if the two leads couldn’t pull of the feat of turning Stan Laurel (Steve Coogan, The Trip) and Oliver Hardy (John C. Reilly, The Sisters Brothers) into believable three-dimensional characters, and the lead actors go beyond expectations to bring their personas to brilliantly-realized life. The story focuses on Stan and Ollie’s attempts to jumpstart their stalled screen career in 1950s England–years after their heyday– through a series of live shows. The goal is to interest potential backer for a new feature “Robin Hood” in which they’ll take on their usual roles: the lanky, deadpan and juvenile Laurel getting himself and the boisterous, cherubic Hardy getting into trouble. Comic complications derive from the interaction between the two as the situations worsen and the odds of getting out of trouble mounts. The pair hopes that what worked in the movies for Hollywood producer Hal Roach (Danny Huston, Game Night) in countless shorts and several classic features in previous years will delight current live audiences. Joining them on various legs of barnstorming tour are their wives: Laurel’s opinionated Russian spouse Ida (Nina Arianda, Tower Heist) and Hardy’s squeaky, small-in-stature better half Lucille (Shirley Henderson, T2 Trainspotting). As the rib-tickling twosome take the stage, the wives’ distinctive personalities and uneasy relationship make for some big laughs behind-the-scenes. Coogan and Reilly, who seemed to be everywhere in 2018, really resemble their characters, not only physically (and how was this film not nominated for an Oscar for Best Makeup? ), but also in the routines that rely on expert timing, slow-burn tactics and subtle reactions to succeed. Watching a real Laurel and Hardy performance will only make audiences even more impressed with how Coogan and Reilly nail it here. They also succeed in capturing the essence of their loving relationship and respect for one another even through some turbulent times depicted in the film. After laying in brief limbo looking for distribution, Stan & Ollie was picked up by Sony Classics and steered to $5 million at the box-office, cresting at 700-plus theaters. That’s not bad considering the film is geared to an older demographic–and it will likely see a major influx of movie fans in the home market. A fine mess indeed.